After co-authoring cookbooks with Mario Batali, Gwyneth Paltrow, and Dana Cowin, among others, Julia Turshen at last published her first independent work, Small Victories, earlier this month, all about simplifying home cooking through tiny lessons. 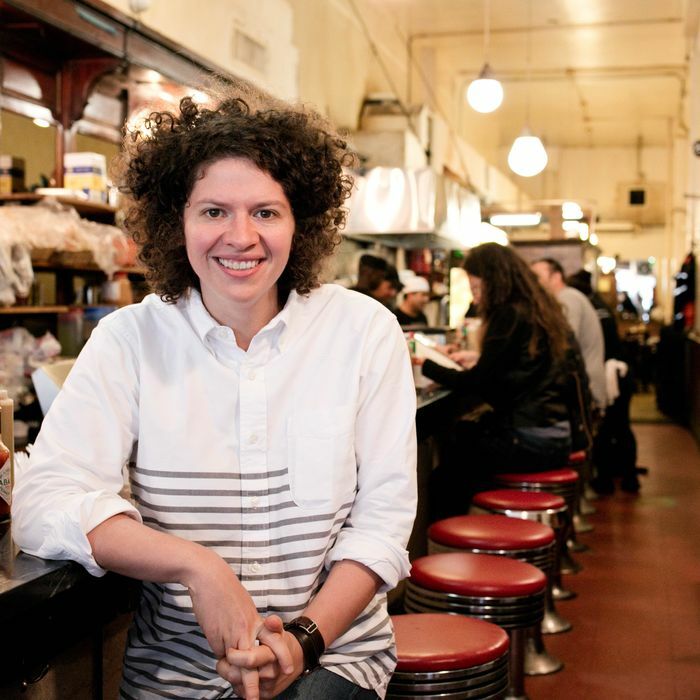 This week, before embarking on her book tour, she cooked at her upstate home and also dashed into the city for meals at old favorites like Eisenberg’s, Arcade Bakery, and Dallas BBQ, which Turshen swears has some of the best chicken soup in New York. This morning started with one mug of coffee that I splashed too much half-and-half in (but is there such a thing? ), so I kept drinking a bit and then topping it off with more coffee until it was light but not too light. By the time this happened, I probably had at least three cups of coffee. I also had a nectarine and then got on an early morning work phone call. While I was on the phone, my wife Grace [Bonney] held up a piece of paper in front of me that said “Do you want eggs?” I nodded yes, and then right when I was done with the call, she had made the most delicious scrambled eggs that had some halved sun-gold tomatoes and a little bit of Pepper Jack cheese in them. I put a few slices of avocado on top of the eggs and splashed them with Cholula, and added a couple of pickled shallots that we had in our fridge. For lunch, Grace threw together a quick tuna salad (I think hers is the best I’ve ever had because she is always generous with both chopped cornichons and mayonnaise), and I dressed some red leaf lettuce with a little Julia’s Caesar salad dressing (page 83!). I toasted us each a small pita bread. (We eat a lot of these because they’re really low-carb.) I sliced a tomato, sprinkled the slices with salt, doused them with a little lemon juice and soy sauce, and showered them with some garlicky sesame seeds (this stuff is addictive). Grace wasn’t in the mood for the tomato, so I ate the whole thing. We each had a LaCroix (pamplemousse for me and blackberry-cucumber for Grace). At some point, I had a large spoonful of almond ice cream (like almond-flavored, not ice cream made with almond milk) straight out of the container. We drove into the city in the afternoon (we live about two hours north of Manhattan), and I brought snacks because I think any drive requires snacks, even if it’s just two hours. The night before I had made us dry-sauteéd string beans, but I had topped and tailed more string beans than our skillet could hold, so I put some in a bag along with a couple of plums and some peeled carrots, and we ate those during the drive. We found a parking spot without trying too hard, which, to me, is the ultimate small victory. We met a friend for a glass of wine (I had “whatever is the driest white you have”) at Sfoglia at 5:30 p.m., which we chose because it’s across the street from the 92nd Street Y, where I was due to be at 7 p.m. to do a talk with the one and only Deb Perelman to celebrate Small Victories. After the talk and the book signing (it went well, yay! ), I walked to JG Melon hoping for a burger and a beer at the bar, but it was so slammed and loud and I didn’t feel like waiting. I left and then saw the beacon of light that is Dallas BBQ. I love that place. It’s consistent, efficient, and affordable, which is more than I think you can say about a lot of restaurants in New York. I sat at the bar and had a frozen margarita (well, maybe one-fifth of it because I’m a cheap date) and then had a bowl of chicken soup. The guy next to me at the bar said, “I eat here all the time, I didn’t know they had chicken soup?” I told him what I know to be true: It’s some of the best chicken soup in New York. He ordered a bowl for himself and concurred, which was kind of sweet. I also had a couple of bites of their very good cornbread, which comes with the soup. I checked into our hotel in Long Island City, found Golden Girls on the TV, and then Grace met me. We rarely stay over in the city, but we decided to splurge because Grace had an early morning flight the next day, so we figured it was best to stay near the airport. When we’re away from home, all we do is talk about our dogs and how much we miss them. So we did that. Grace left early for her flight to Savannah (she has an amazing, important book coming out in October and was on her way to moderate a panel at SIBA). I grabbed a coffee in the hotel lobby, which I mistakenly thought was free and then got tapped on the shoulder. Oops! Before driving home, I stopped at Eisenberg’s (where “you either get it or you don’t”) to have breakfast with my literary agent and friend Kari [Stuart]. Eisenberg’s is one of my absolute favorite places in New York. Whenever my dad and I go together, we always end our meal with a slice of babka, which they will warm up and gently crisp on a buttered flattop if you ask them to, and once you have babka that way, you can never go back. I digress. Kari ordered a mushroom omelette with crispy bacon on the side, and it sounded so good that I asked for the same exact thing. I had an iced coffee and a good shake of Cholula on my omelette. And then Melissa came and snapped my photo for this very story, which the guy behind the counter seemed to get a kick out of. While driving home, I realized there was still a plum left from yesterday. I ate it, and it was so good that it made me think of the Modern Family episode where Phil goes a whole summer without ever eating a bad plum. I got home, had a real cuddle puddle with our dogs, and and I ate the last four sun-gold tomatoes from our plant, which is sadly on its way out. I also had some vitamin C tablets because Gail Simmons told me that when you’re on book tour, you need to take your vitamin C and use hand sanitizer all the time, and I think she is the best and I am happy to take any and all advice she has to offer. I caught up on emails while noshing on a lot of watermelon that I cut into big pieces, squeezed some lime over, and sprinkled with a little bit of salt. A little while after that, I ate a bowl of Kix with a sliced banana and a lot of blueberries and a little bit of skim milk (which I only ever buy for cereal). Every now and then, I get a big craving for cereal (usually a day after watching Seinfeld, I might add). Later, our friend Larry came by and picked me up, and we met his husband Jeff at a really sweet restaurant in Kingston called Elephant. I had a glass of white wine, some very good olives, a piece of bread with a little olive oil, and then Jeff ordered the excellent Caesar salad that promised a lot of good Spanish anchovies on top, and the roast chicken. It all sounded so good that I said, “I’ll have the same thing” (seems to be a theme today?). I nursed my single glass of wine through dessert. I had a couple of bites of the almond tart and a few bites of the pineapple, which was drizzled with molasses and sprinkled with lime zest, both of which we ordered for the table. The first time I saw that pineapple combination was in Spain, when I helped work on this book, and I haven’t seen it anywhere since, so it felt kind of lovely — one of those moments where something from the past pays a visit to the present. I woke up and puttered around, doing things like laundry and straightening up the house. I fed our dogs and cat, and turned around and saw the cat was eating the dogs’ food and vice versa, but what can you do? While puttering, I ate the rest of the watermelon that I cut up yesterday with more lime and salt, and I poured the coffee that was left in our coffeemaker from Thursday morning over ice and drank it with a splash of half-and-half. Then I drove up to Kingston to pick up some dry-cleaning and to go to the Kingston farmers’ market, which is just the nicest thing to do on a Saturday morning in our neck of the woods. I got a small carrot muffin at a stand and noshed on it while I did my scan of the market, and then I stocked up on lots of vegetables. I also stopped into Fleisher’s butcher shop to get some chicken and pork tenderloin (more on these things later). I got home and had about 20 minutes before I had to head to Newark to scoop up Grace. I made my favorite five-minute meal, which is two scrambled eggs that I fold some chopped kimchee into right as I pull them off the heat. I cut up a small cucumber, a carrot, a yellow tomato, a large radish, and some raw red onion (all from the shop that morning), and made the easiest, fastest, best dressing, which is a spoonful of kimchee juice and a spoonful of mayonnaise whisked together and seasoned with salt. I ate all of that out of a bowl with a spoon and sat outside in the backyard with the dogs, so they could have a little run around. I chopped a few extra carrots, radishes, and cucumbers and threw them in a bag along with a LaCroix and an apple from the market for the drive (#alwayspacksnacks). I got in the car and caught up on the last few episodes of Sooo Many White Guys (and, small world, the very funny Phoebe Robinson was last week’s Grub Street Diet chronicler!). On our way home, we stopped at our favorite fish store, Gadaleto’s, to pick up some cod to cook for dinner. We got home and each had one of our trusty pita breads with a little peanut butter for a snack (I had mine with some sliced banana on it), and I marinated the boneless chicken breasts from Fleisher’s in the rest of the Julia’s Caesar salad dressing (it doubles as a great marinade), and seasoned the pork tenderloin with a mixture of garlic powder, ground cumin, chile powder, and salt. I parked theses items in the refrigerator while Grace and I took the dogs for a long walk. When we got back, I had a whirlwind hour of cooking. I started our grill and set a large cast-iron pan on it to get nice and hot. Meanwhile, I cut up a small orange cauliflower and a small head of romanesco, and tossed them with olive oil and salt and set them in our trusty toaster oven to roast. I grilled the chicken breasts and pork tenderloin and put a little oil in the now extremely hot cast-iron pan. I seasoned the cod with Paul Prudhomme’s Magic Seasoning (which I love) and set it in the hot, oiled pan. This is my favorite way to cook fish because you can get your pan super hot, and you get that nice sear on the fish — the kind that restaurants get — and you don’t fill your home with fish smoke or oil. I made a quick mustard vinaigrette (a spoonful each of mustard and red-wine vinegar, two spoonfuls of olive oil, salt and pepper), and used it to dress some salad greens from the market. There was a little dressing left over, so I put it on the warm roasted cauliflower and romanesco. I squeezed lemon over the fish, and we had that with the salad and vegetables for dinner. I let the pork and chicken cool, and then put them in containers to have on hand for salads and sandwiches for the next few days. While all of this was happening, I also made dinner for tomorrow. I salted and browned three large bone-in, skin-on chicken breasts in a big, heavy pot, and when they got really browned on both sides, I took them out and set them on a plate. I added a few chopped leeks and a few sliced bell peppers and about a dozen peeled garlic cloves. I seasoned those with salt, and once they got soft, I added a large spoonful of pimentón and then about a cup of water. I brought that to a boil, turned the heat down, nestled the chicken back into the mix, and let it simmer, partially covered, for an hour. I turned off the heat and let the chicken cool and then I put the whole pot in the fridge, so that tomorrow night, we can just heat and eat (one less thing to do; plus, these types of stew-y things always taste so much better the next day). After dinner, I had two scoops of toasted-almond ice cream. I woke up really early and went for a short jog (I turned the coffee machine on before I left, so it would be ready when I got back). I jumped in the shower, and by the time I was dressed, Grace had very sweetly made me scrambled eggs with some sautéed mushrooms in them and the rest of last night’s cauliflower and romanesco. I had those with Cholula on top, and a mug of coffee with half-and-half (and then ate Grace’s eggs that she didn’t finish). I poured another coffee into a travel mug and threw two apples in my tote bag and got on the road. I drove into the city to go to the Brooklyn Book Festival, where I was on a really wonderful and heartfelt panel with Andie Mitchell and Pierre Thiam that Helen Rosner moderated. After catching up with friends who came to the panel, I got back in the car and ate one of the apples and made my way to H Mart in Ridgefield, New Jersey (right over the GW Bridge), and had a bubbling pot of kimchee jiggae that had little bits of pork and tofu in it, along with some radish kimchee on the side and white rice. It hit the spot, and I am forever grateful to Marja for introducing me to the food court at this grocery store many years ago when we were working on this book. I browsed the store for a bit and ate some fruit samples they were giving out (including the biggest grape I have ever seen), then I got back in the car and ate my second apple. Today’s driving was made really effortless by a lot of episodes of Revisionist History. When I got home, I ate two spoonfuls of the toasted-almond ice cream out of the container, and then Grace and I took the dogs for a long walk. When we got back, I poured a Corona Light over a tall glass of ice and added a big squeeze of lime. We put the braised chicken that I made last night on the stove to heat up. I roughly chopped some very peppery arugula from yesterday’s market haul and dressed it with olive oil, lemon, and salt and added a little bit of shaved Parmesan cheese to the salad. We were both kinda exhausted, so we ate dinner on the couch while watching the latest Real Housewives of New York reunion episode, because sometimes I like television just like I like beer: light, cheap, and easy to understand. That toasted-almond ice cream that I had been rationing? I finally scraped the bottom of the container. Grace had an early start, so she had made a zucchini frittata the night before and very kindly left me half of it. I spread one of our go-to pitas with a spoonful of ricotta cheese and broiled it in the toaster oven and sprinkled it with salt and dried oregano, which basically made it taste like a mini white pizza. I put the piece of zucchini frittata on top to make an open-faced sandwich. Over the course of the morning, I had two large mugs of coffee with half-and-half. Around 11 a.m., I felt suddenly very hungry, but felt like it was a little too early for lunch. I thinly sliced some of the grilled pork tenderloin and ate the cold slices with Dijon mustard and also had a few cornichons. And a coconut LaCroix. That kept me at bay for another hour or so. For my “real lunch,” I remembered that in addition to the frittata from the morning, Grace had also left me some sautéed zucchini. I added that to what remained of the braised chicken, and warmed it up for a few minutes. Remembering how good the arugula salad was with the chicken last night, I threw the rest of the arugula into the chicken right as I pulled it off the heat, which wilted just the way spinach does, but with a lot more flavor. I ladled everything into a big bowl and ate it with a spoon while working on a book proposal. It was a perfect lunch, because it was gray and rainy outside, and it was nice to have something so comforting. I had two more coconut LaCroix and, at some point, a small handful of Guittard dark-chocolate baking wafers, which I like out of hand as much as I like inside cookies. Well, I prefer them inside cookies, but one of these things is much faster than the other. Many months ago (maybe even close to a year? ), one of my best friends Cleo snagged us tickets to go see Adele in concert. I have been counting down the days! Around 3 p.m., I drove to our neighboring town to catch the bus into the city. I broke my always-pack-snacks rule since I was really full from lunch and was going to meet Cleo, her mom, and their wonderful friends George and Sean at Keens for an early dinner before the concert. We all shared blue-cheese wedge salads, sirloin and strip steaks, creamed spinach, and the great Keens hash browns. Before that all hit the table, I had a vodka on the rocks with olives, and some more olives from the relish tray, plus lots of carrot and celery sticks. We rolled ourselves over to Madison Square Garden, and I’m still pinching myself to check if I dreamt the concert. During the concert, I had about a third of a beer and spent the whole time just mesmerized. Since I stayed over at Cleo and her fiancé James’s apartment, I got to have a little iced coffee at their apartment, and then went to Tribeca with Cleo and had more iced coffee at Arcade bakery. We split a plain croissant and a ham-and-cheese croissant. The smell of butter and bread that hits you when you walk into Arcade is totally intoxicating. Before we left, I took a few deep inhales. I made my way back to Port Authority to catch the bus back home and was a little early, so I went across the street to Dean & DeLuca. After Keens and croissants, I was craving fruit. I bought a container of (overpriced) fruit salad, and brought it on the bus and ate it while looking at photos and videos of the concert on my phone. For the entire two hours. Grace picked me up at the bus station, and we made a quick detour to the High Falls Food Co-Op, a very special spot near us where we often get groceries. We were out of salad greens, so we picked some of those up, and I also got a vegan banana–chocolate chip–walnut muffin because I was starving and I’m a sucker for anything that mentions those three things. On the drive home, I ate the top of the muffin and saved the rest for later. When we got home, I made big green salads for the two of us with some sliced cucumbers, carrots, radishes, and raw red onion, plus the grilled chicken we still had left from my cooking power hour on Saturday. I put in a few hours of work and ate basically an entire bunch of grapes while doing so, plus two coconut LaCroix. And the bottom of my muffin. Grace and I took the dogs for a walk in the early evening, and then we made dinner. We made another batch of toaster-oven-roasted cauliflower, and I stir-fried green beans and tatsoi with ginger, garlic, and soy sauce. I also thinly sliced half a red onion that was kicking around in the fridge, and stir-fried it with some sliced shiitake mushrooms and then added the very last of our grilled chicken and pork tenderloin. Right as I pulled that mixture off of the heat, I added a bit of soy sauce and fish sauce. I realized it will be the last dinner I’ll eat at home for the next ten nights, because tomorrow I head off on my book tour. As excited as I am, I am already having separation anxiety from our kitchen.